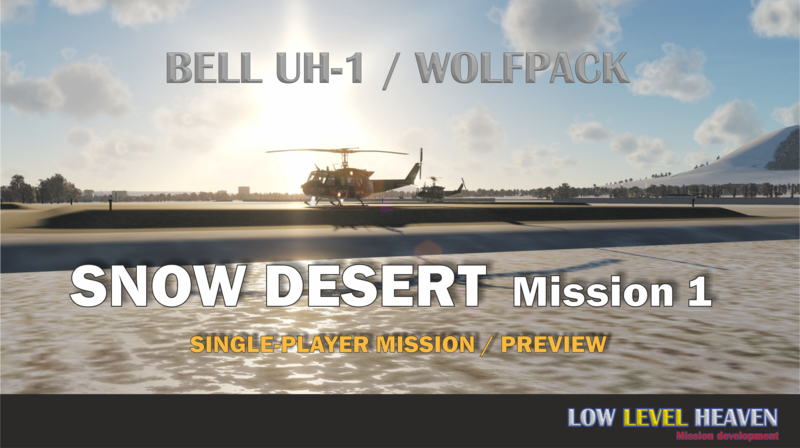 Fly a troop transport mission as part of the UH-1 Squad WOLFPACK. Together with your squad leader and a 3rd wingman. Approach the LZ in close formation disembark and assist ground forces in their effort to overtake a city from the unfriendly. There are many ways of creating a multiplayer mission. One of them is to take an already existing single player mission and add a few more client aircraft. Another way is to build the mission from the button on as a multiplayer mission. That’s what we have done with this Multi-Player-Group-Mission. We share the same story and even the same task, which is troop transport, but we designed it new entirely, using the freedom you have when there is no AI that limits your reactions on enemy contact or the ability to fly as low as possible. What is a Multi-Player-Group Mission? It requires good pilot skills discipline and the ability to function as a group. It's a mission designed to fly as a squadron of at least three aircraft. The primary goal is to fulfill the mission without getting shoot down. The ability to spawn again after being shoot down is limited. You can fly the mission several times. The position and strength of some enemy units may vary randomly. Also reacts the mission on the number of aircraft activated at mission start with more or less enemy presents on the map to adapted and outbalancing the level of difficulty..